July 1945. The WCTU met July 17-1945 at the home of Mrs. Jackson, with an attendance of 24. Mrs. Jackson read the devotions and presided at the business session. Mrs. McBlain presented the program, on the topic, Service Men and Women. Twelve million men and thousands of women have been serving overseas. Minutes of the June meeting were read and approved. Edna Sherman told of getting a letter from Krl LeKompte. She advised us to write to Francis J. Kubal, the man that begins to clean up Polk County and express approval. The report of the nominating committee was read, to be voted on in August. Report was as follows: President, Mrs. Jackson Vice President, Mrs. 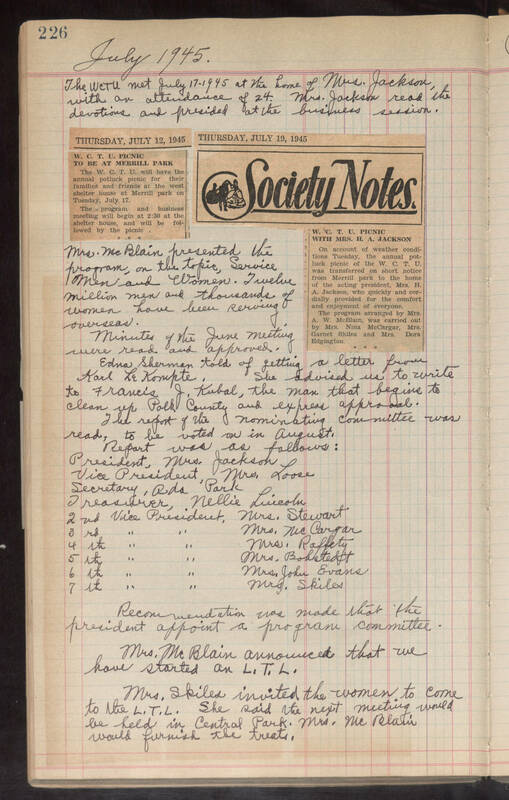 Loose Secretary, Ada Park Treasurer, Nellie Lincoln 2nd Vice President, Mrs, Stewart 3rd " " Mrs. McCargar 4th " " Mrs. Raffety 5th " " Mrs. Bobstedt 6th " " Mrs. John Evans 7th " " Mrs. Skiles Recommendation was mad that they president appoint a program committee. Mrs McBlaine announced that we have started an L. T. L. Mrs. Skiles invited the women to come to the L. T. L. She said the next meeting would be held in Central Park. Mrs. McBlain would furnish the treats.